This period, the versatile blogger award nomination has been going on. Interestingly, my blog mother nominated me first and then Gloria Okaimam and maybe another person somewhere that I am not aware of. Really, for me it’s not about the nomination I got from these persons, but by the glee in the chain of nominations. Where it started from, I have no clue and where and when it will end, I cannot guess either… but it makes you feel good that someone out there is noticing you in what you do on blogsville. I am very sure some bloggers here got as many as 10 or even more nominations from various bloggers, some got only one, in any case, it’s good to have been mentioned for doing something right here. I have also observed that the string of nomination by a blogger does not necessarily go down well for some who discover that they are not on your list of nominees. Thoughts like “my name did not come up on this list after I frequent this blog and drop comments regularly” come up. I believe that not being nominated does not make you less a blogger than you are, infact it should even spur you to improve on your passion for blogging. Funnily, nominations for the VBA is being treated like the award has been received already, for me that’s the beauty about it all; so much excitement just being a nominee, what if you now win?. Now, I feel the urge to ask: would the Versatile Blogger of 2015 ever be announced? Who was the winner of the award for 2014 and previous years? Who are the organisers of this award? If you’ve got the answers, kindly help take me out of my naiveness on this matter through your comment bellow. But whether the answers come or not, my thumbs are up to those who thought out the award in the first place. 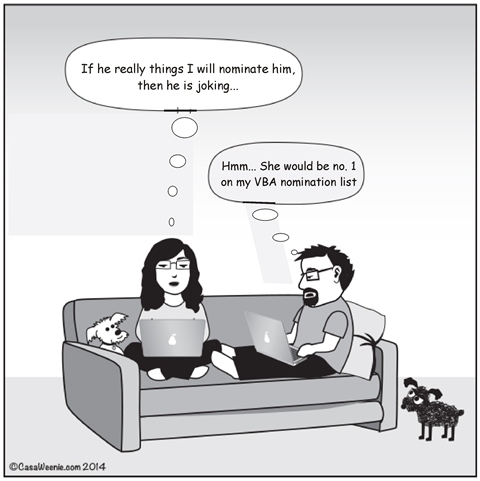 Gloria will be expecting the acknowledgement of my nomination on her blog; this is it o…lol. Make reference to this post "Versatile Blogger". Also, know that I am most excited about the nomination and that you have given me one more reason to continue blogging. You can’t imagine how much my blog mama does to get me to blog…lol (I am just a lazy blogger). Then to my blog mother, you forgot to ask me your question of the day when you nominated me, until I reminded you – How much do you think your blog is worth? Seriously, like seriously, did you really ask me that? Lol… anyways, if you must know, my blog cost my emotions and leisure (not in it's totality though); if you can quantify these two things and monetize it, then put up a proposal for me, I may as well consider it. If you have not responded to my nomination or any by another person, please try to find out time to respond. Saheed, I include you on my list. Fun it is. I will be looking out for you response...want to find out intimate things about you. Lol. That's so true at least through it, I have met some more awesome bloggers. You don't have to wait o... Click the link bellow to read 7 things about me you don't know. While I think awards like this are beautiful, I don't really think they should be used as signposts for your relevance as a blogger. As long as you have something to say and you say it well via your blog... you're a blogging MVP. Thanks for the blog design makeover of yesterday... you would make good money in the graphics world sef. "If you are nominated, you’ve been awarded the Versatile Blogger award." I picked that word for word from the site you referenced. It settles the greater part of my queries on the award. And yes, I agree with you; blog because you have something to blog about, blog. We are all blogging MVPs. You know I don't wash.... was mighty impressed by the new design. I've been nominated before and I've done the post already. Congrats Ugo. I was nominated earlier this year, nd twice again this week. Ain't I blessed. #Godwin. You are more than blessed.... I think I saw the award first on your blog. Now you are a multiple award nominee and winner... Cheers! A new born babe to be precise... Lol. Let me apologize for late my response, I've not been visiting blogs these days due to some personal stuff. Thanks for the nomination and thanks so much. I never thought we think in the same direction with you, The idea, who brought it up, what was their intention and who gives the award out to the winners? Up till now nobody has answer that questions because I refused to ask until now...LOL. Whosoever the initiators are, I sensed it is just away of saying ''I NOTICED YOU"....and I like what you are doing. You are so on point... I noticed you and I like what you bare doing, and so I nominated you, even though it seems late, but better late than never. Don't you think we (I) will be interested in reading the 7 things we don't know about you? Like some have noted, it's all part of fun in the whole VBA thing.